Sojo was playing by herself this afternoon, and I stopped for a moment to soak up all the clutter and goodness in our living space. From the sunflowers gifted by my niece to the sunlight coming in on my favorite yellow pillows to the brand new painting Sojo made for above our newly painted wall and fireplace, it felt soulful and wholesome and summery. This is the time of our vacation when the end is imminent, and I wonder why we are not living here in this house I love with family nearby. I'll be fine once we get settled back in Saudi, but there is always a big dose of heartache leaving each year. A better closeup of the painting and the fireplace, which I adore!! Sojo let me help her with the orange part. It's called Chicken Pox Sky. Our spectacular town of Port Townsend is a little thumb of land surrounded by freezing cold, but very pretty, water. We head to the beach at least once a day, and this summer, we have been branching out a bit rather than only hitting our favorites (mine is the beach right next to the best coffee shop in the world). Our new favorite is North Beach, which we have been to before, but not at low tide where it becomes this expansive beauty filled with tidepools. I discovered the low tide surprise when I went for a walk the other morning. North Beach was my destination, and as I walked on the beach, I spotted this brilliant orange starfish in the distance. I carried it ever-so-gently in my hand for the two miles home, and it now sits beautifully on our mantle as a reminder of how much I love this place. I swear I walk over to look at it at least ten times a day. I grabbed the whole family the next morning to show them what I discovered, and we all had a blast tidepooling. Dale spotted two huge otters munching away on something out on a rock, and it was amazing to see them so close. Sojo and her cousin were fascinated with the marine life and the perfect sand for building. I'm amazed at the perfect juxtaposition of our life right now--the barren desert for most of the year and this peninsula teeming with life at every turn. Both move me in different ways. My favorite find of the morning were these tracks in the sand made by the water. They looked like perfect little spindly trees. Add a heart rock with algae, and it's perfect. Our summer is consisting of cousins, brothers, walking and so much ice cream. Two trips to the ice cream store today--such summertime permissive parents we are. We headed down to a lake near my niece's house the other day for a birthday party. While we thought it would be way too chilly for a swim, Sojo dove right in and declared it a warm lake. The cousins had a ball jumping off the raft and swimming around. She only told me later she was freaked out by the animals she thought might be in the lake. Just watching her brought me back to my own childhood, one filled with squishy mud at the bottom of ponds and summertime lake swims. We love our summer stopover to break up the trip home, and this year we chose London. It was Dale's choice as he loves Shakespeare and the theater more than anyone I know. Somehow we were not quite thinking that London has a million things to offer, and we scheduled a mere 3 days in the city. With sunny weather and a great location on the South Bank, we took advantage of the time we had. Our biggie was a 45 minute train ride into the English countryside to visit Roald Dahl's museum and hometown of Great Missenden. It was so nice to get a glimpse of something other than slightly chaotic London, and the charm of the village was quintessentially English. We wandered around the town afterwards and even read a Roald Dahl book during lunch. We spent the rest of the time meeting up with friends and former students in the area of our hotel, which was right near the Thames and the London Eye. We only scratched the surface of all London has to offer, and I"m not sure vanilla ice cream counts as a cultural activity. I have a feeling this city will be on the summer stopover tour another year. Poor Dale never even got to the Globe theater! We must go back! Dale and I are big on not taking ourselves too seriously. We are pretty great at keeping each other in check in life, and we laugh at ourselves quite a bit. We also tease each other like crazy, but we both feel it's the secret to our bliss. "Dear Diary....wait--that's not right. I wrote Dear DAIRY instead of Dear Diary"
"Dear Dairy, I love yogurt and cheese soooo much. They are the best. So is butter. I love all dairy." Insert hilarious, literally knee-slapping belly laughs. Now, all we have to say to each other is...."Dear Dairy" and we laugh like mad. Even when we went to the store for food the other day, I said to her, "Please be careful here because I know how much you love dairy. I don't want to catch you hugging and kissing random dairy products." So, of course, we had no choice but to do just that. Here's to living proof of my parenting (and teaching) motto: Love 'em through it. Every year on the very last day of school, the entire kindergarten through 9th grade have a massive Water Fun day. It's absolutely legendary in our community, and kids convince their parents to not leave for summer break until after the Water Fun day ends. Truly, there are many who grab their suitcases and head off to the airport right when it's done. Some kids come back from boarding school in time to join in the fun, and it's pretty cool to see everyone so excited. Sojo was sick last year on the last day of school, so she missed it. 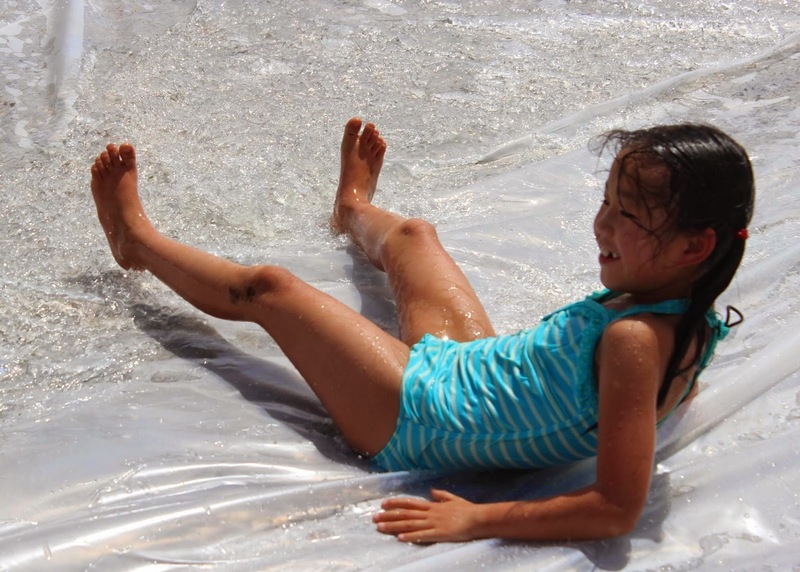 Neither Dale nor I were with her at her events, but this is the photo someone had of her going down the slip and slide. She had an absolute blast. Mind you, the heat was ferocious, but it didn't seem to bother her one bit.